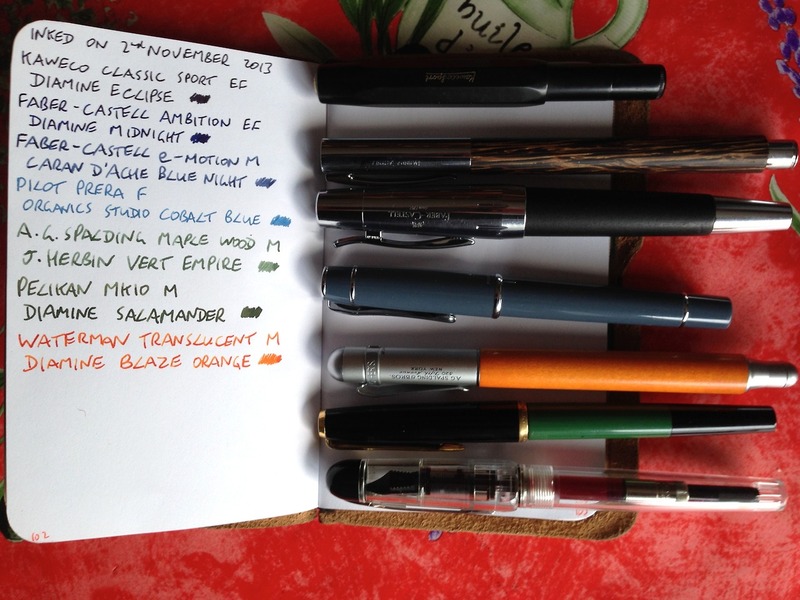 Inked on 2 November 2013 – Pens! Paper! Pencils! A new pen and a few new inks this week. Kaweco Classic Sport EF with Diamine Eclipse. Faber-Castell e-motion M with Caran d’Ache Blue Night. This is from Caran d’Ache’s now discontinued range but I was able to pick some up from The Writing Desk. It’s a lovely dark blue. Pilot Prera F with Organics Studio Cobalt Blue. A new brand to me and an absolutely gorgeous ink. >A. G. Spalding Maple Wood M with J. Herbin Vert Empire. I’m really enjoying the J. Herbin inks I’ve bought so far and this is a very lovely green. Pelikan Mk10 with Diamine Salamander. Brad Dowdy reviews a Pelikan and I decide I must have one. I don’t have the budget for a M205 at the moment so I had a rummage through eBay and found this. It was a budget pen 30 to 50 years ago (I don’t know when mine was made) but it’s a piston filler with a beautifully writing nib. Very pleased with it so far (it only arrived today)! The ink is a new one from Diamine and it’s gorgeous: very dark green with touches of gold (to my eye at least). Waterman C/F M with Diamine Blaze Orange.